The healthful, contemporary cuisine is prepared with the best-quality sustainable, seasonal and organic products available. : Reno's small and mighty 4th St. 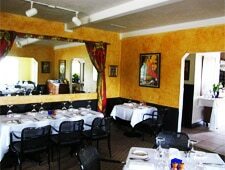 Bistro, situated inside a converted home on old Highway 40, delivers inspired, contemporary cuisine. Chef-owner Natalie Sellers (Chez Panisse, Stars) and partner-general manager Carol Wilson take care to present the best-quality sustainable, seasonal and organic products available; they were some of the city’s earliest adopters of the local food movement, and have been hand-picking produce from area farms since the restaurant opened in 2000. Sellers' passion shines through in entrées such as grilled Niman Ranch filet mignon with haricots verts and potato-Gruyère gratin, the duck leg confit, and vegetarian pasta with pop-in-your-mouth Laughing Bird shrimp. Soup is a must. The cheese plate (with pepper jam, local honeycomb and almonds) for dessert is a lovely finishing touch. The full bar and cocktail program --- including a fine, house-made limoncello --- and thoughtfully prepared wine list wrap up the experience.